The Most Important C in CCRC is Community! Throughout life we know there are many factors that go into maintaining our health both physically and mentally. As we age, many of these factors grow even more important as Americans are living longer today than past generations. Recently, AARP and ASHA completed a study to help people learn more about how to not only live a long life but one with high quality. In short, the study suggests that where you live matters. One should be in close proximity to destinations (parks, libraries, transits, etc. ), have personal safety within their neighborhood, access to exercise options, health care professionals and quality care, and also plenty of opportunities for civic and social engagement. While all of those factors are truly important, after coming across the Harvard Study of Adult Development, the question about the importance of social involvement came to the forefront; is the most important C in CCRC Community? Robert Waldinger, director of the Harvard study, states that findings show “taking care of your body is important but tending to your relationships is a form of self-care too. That is a revelation.” It is social interaction and ties to people that help guard and protect us from life’s ebbs and flows, which in turn delays mental and physical decline. In contrast, the health risks ASHA has found associated with loneliness and isolation are; high blood pressure, increased risk for depression, higher risk for heart disease and stroke, and an overall faster cognitive decline. The Global Council on Brain Health shows evidence that social engagement can help maintain your thinking skills and slow cognitive decline, while other studies link an active social life with better cardiovascular outcomes and greater immunity to disease. So, I am sure you are thinking, “wow this all sounds depressing and what does it all mean?” As we age we should find ways to be involved. There are many great ways to stay engaged. Value time with friends and family: phone calls, emails, or even face-time or skype, if loved ones are far away, are great ways to regularly communicate. Set up coffee or lunch dates with your friends. Visit a local park where you can walk and chat together with others. Join Groups: find a group or organization that is the right size for you and become a member. Whether you volunteer at a nonprofit, school, church, or community group, you will enjoy working with others and giving back. Explore the idea of reading and book clubs, sewing, bridge, painting, or continuing education seminars. Whatever your hobby is, there is a group waiting for you to join. 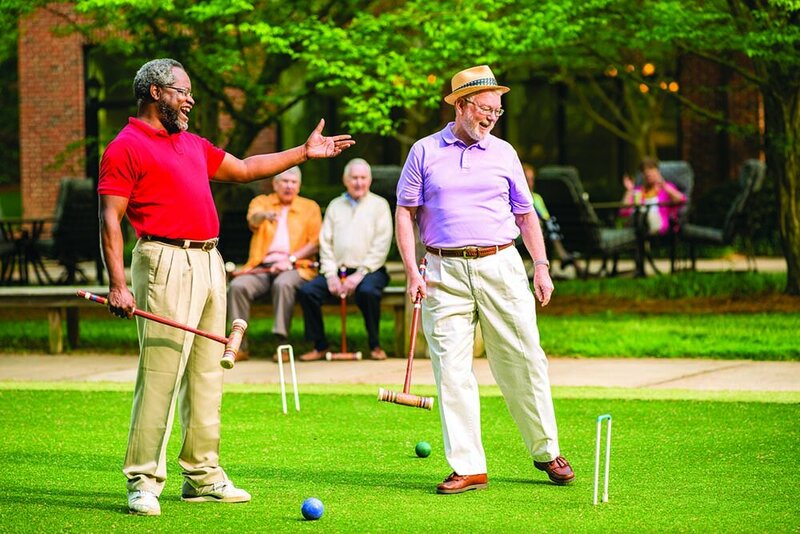 Senior Living Communities: many residents say living in a senior living community provides them with a plethora of ways to meet people and get involved. They have daily events, activities, clubs, dining venues, and tons of new neighbors their age to cultivate new friendships within the community. The last bullet point most highlights why Community is the most important C in CCRC. The New England Journal of Medicine reveals how spending time enjoying leisure activities with friends and loved ones keeps you socially engaged, which breeds happiness and better health. The benefit of living in communities that offer life enriching programs, opportunities to volunteer, peer-to-peer support, well-balanced meals, and a wide variety of fitness and wellness programs is the key to better living overall! At SpringShire, we aim to provide our future residents with an active and independent lifestyle. Come be a part of a Community at SpringShire. Independent living when you want it, care when you need it, but always Community!